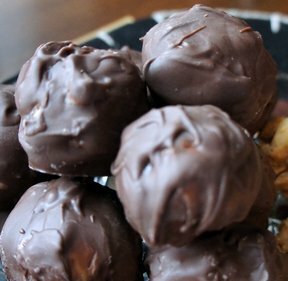 Semi-sweet chocolate coats these creamy peanut butter balls with a hint of crunch from the crispy rice cereal. Who needs a holiday to make these? You can make them year round. Melt the peanut butter and butter in a saucepan over low heat. In a large bowl, mix the crisp rice cereal and confectioners' sugar well. Pour the melted peanut butter and butter over the cereal mixture. Blend together thoroughly. 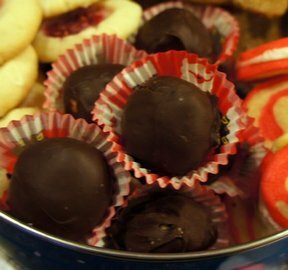 Form into 1-inch or smaller balls and place on cookie sheets lined with waxed paper. Chill in the refrigerator until firm, overnight is okay. 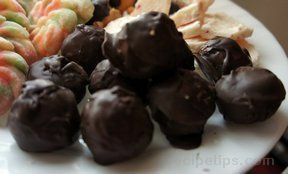 Melt the chocolate chips in a double boiler and warm as necessary so the chocolate stays melted while working with the balls. 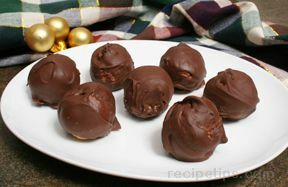 Using a teaspoon, dip the balls in chocolate, then place on cookie sheet lined with waxed paper. Chill until firm.